About strange birds and fantastical stories. A small black bird with yellow legs, a prominent crest and a loud, raucous call: everyone in Singapore knows the Javan mynah. And many hate him. ‘The Migrant’ is a fantastical multimedia story about our relationship with animals, rapid urbanisation and our attempt to shape an ideal society. 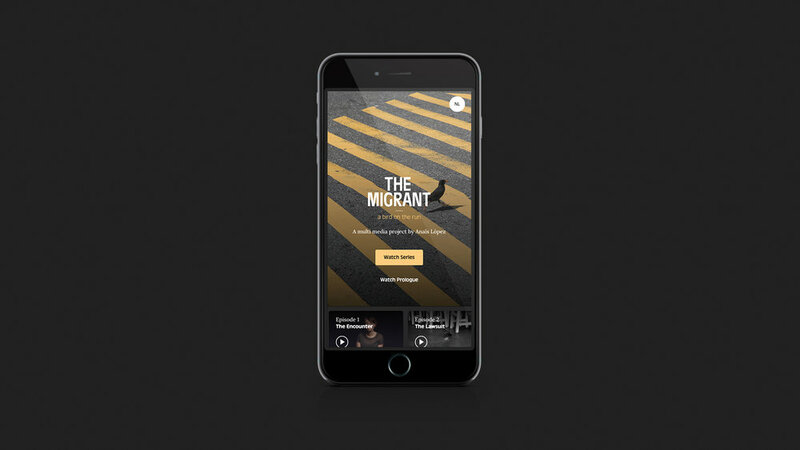 The Migrant is a producer's dream project. Anaïs López is a storyteller at heart. She tells about her encounter with bird Mynah both dead serious and with lots of humour at the same time. She is quirky and open for collaboration. The Migrant is a text book example of cooperation, experiment and cross-over. All the people involved did something they never did before. Together with radio maker Laura Stek we wrote the scenario. 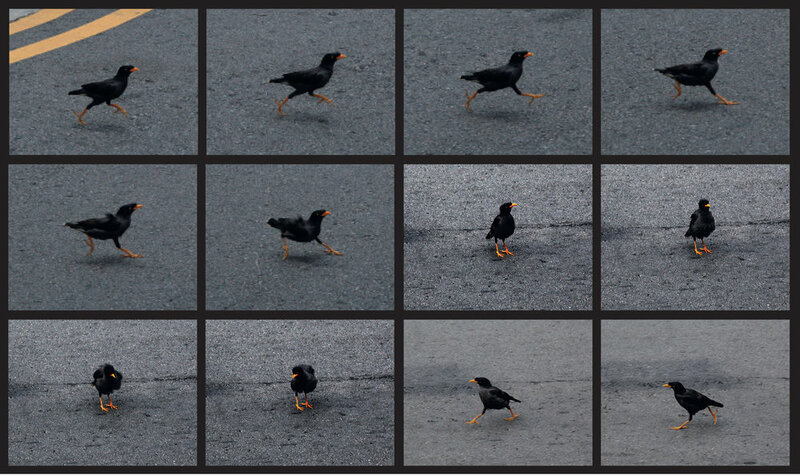 Editor Thomas Vroege brought the still images of Mynah to life in beautfiul film scenes. Book designer Teun van der Heijden created an art object thats forms the basis of a theater performance. And Anaïs herself transformed from a photographer to film maker and live storyteller. The result is a documentary story with a fabulous layer, or rather: a fable with a journalistic undertone. Our experiment was embraced by a representative of the old media; Dutch national newspaper Trouw. That’s the great thing of this time: the possibilities are endless, old and new media find and strengthen each other. And the moral? Listen to strange birds! It was in Singapore in 2012 that photographer Anaïs López first encountered the Javan mynah, a small black bird with yellow legs, a prominent crest and a loud, raucous call. This incessant noise outside her hotel window first attracted her attention. Intrigued, she began to investigate and a project was born. ‘The Migrant’ tells the turbulent life story of the Javan mynah. A member of the starling family, the bird is originally from Java (Indonesia) and was introduced to Singapore in the early 20th century via the songbird trade. Today, the feathered friend is reviled, persecuted and even killed. One of the reasons for this is its unique ability to mimic sounds. Following the Second World War, Singapore underwent rapid change, transforming in a matter of years from a rubber trading post to a modern metropolis. In an effort to compete with the urban noise, the mynah’s beautiful singing voice became a shrill screech. This did not fit the image Singapore wanted to present as the perfect city. ‘The Straits Times’, Singapore’s national newspaper, even described the mynah as ‘the new terrorist’, and, like a terrorist, the bird is almost universally hated. ‘The Migrant’ tells the remarkable life story of one bird, but at the same time it addresses broader themes such as the complex relationship between humans and animals, the consequences of rapid urbanisation and the position of the unwanted outsider. Using audio, video, text and photography, López takes you on a unique journey. ‘The Migrant’ is a thrilling, interactive narrative in five episodes of around seven minutes. At the heart of the narrative is a linear web documentary composed of moving images, photography and audio, in which Mynah’s story is interwoven with López’s research. Icons appear at intervals during the story. 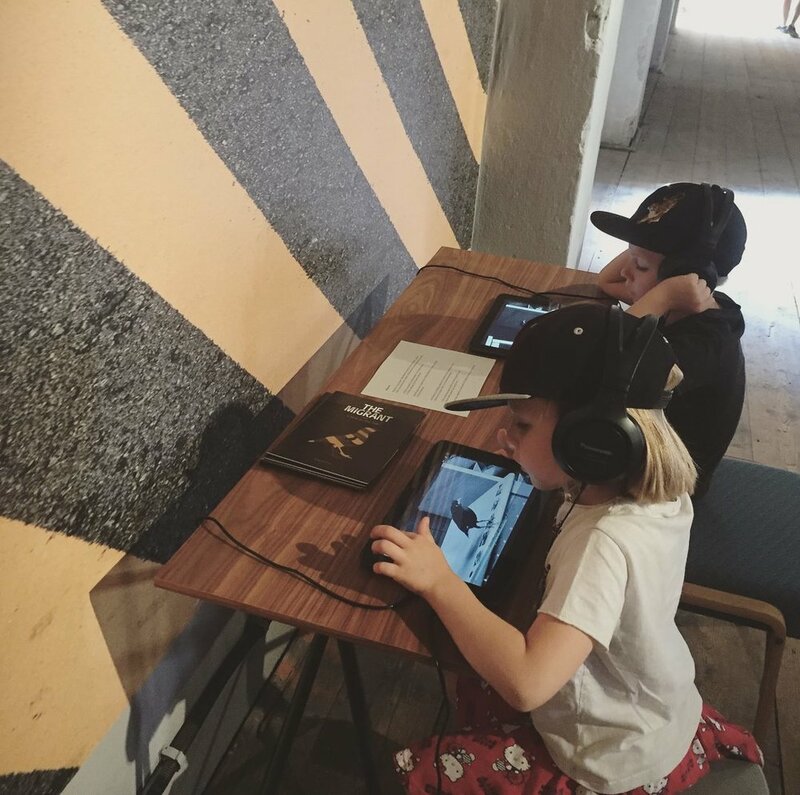 These unlock extra content, such as recordings of bird sounds, archive material, short films, a slideshow with additional images or interviews with experts, which contextualise the story. Watch 'The Migrant' online! 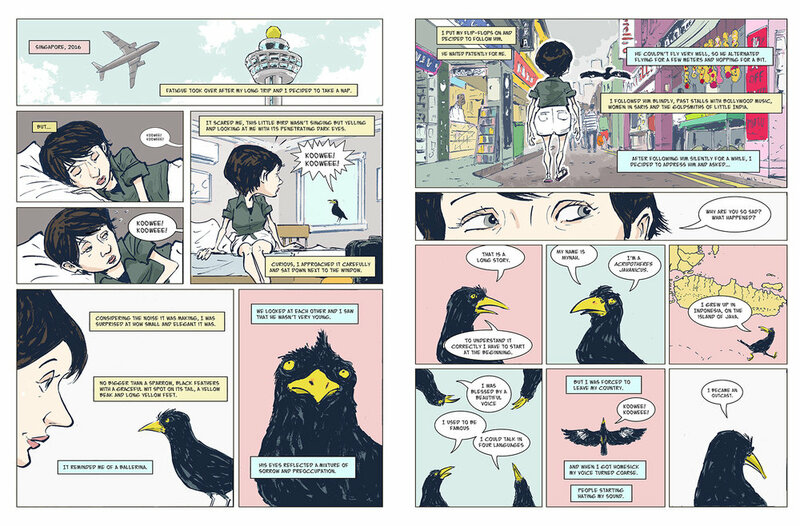 The book recounts López’s adventure in Singapore and her fascination with the mynah. It was designed by the multi-award-winning graphic designer Teun van der Heijden and illustrated by the renowned Singaporean comic artist Sonny Liew. Liew has been drawing Singapore and its animals for years and is an expert at capturing the details and atmosphere of the city state. Only three copies will be printed in a monumental A3 format. The book is not intended to be functional but is rather an art object; a tome of mythical proportions that forms the basis of various exhibitions and a live performance during which López takes listeners on an incredible journey. After the performance, visitors can share the online version with others. A limited edition of the book is now also for sale through the website van Anaïs. Anaïs tells Mynah’s story live on stage. Check the website to see where you can visit the performance. 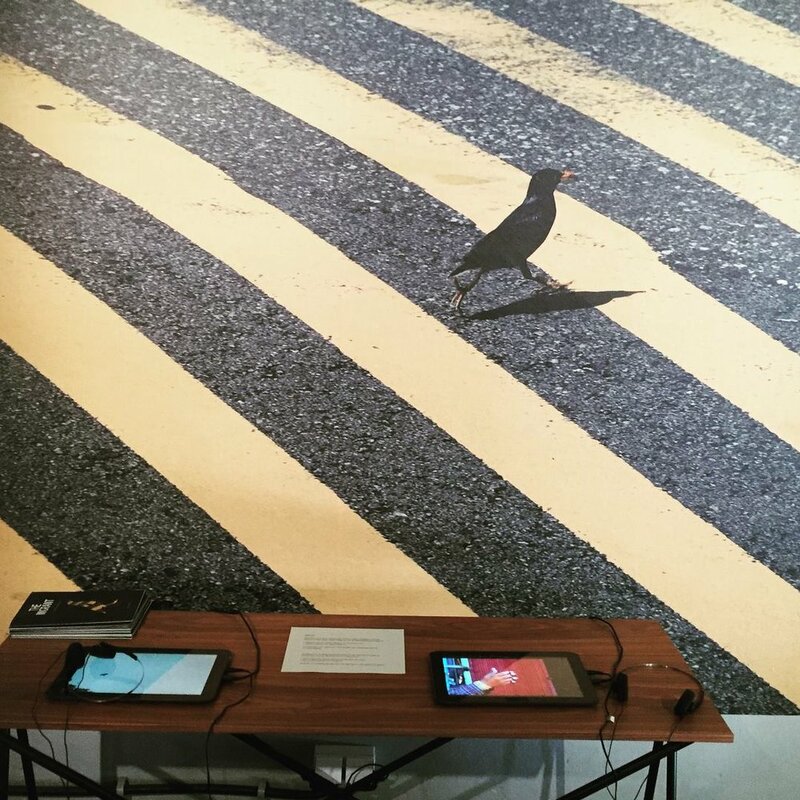 Mynah loves to fly and ‘The Migrant’ can be exhibited in various ways. The basic elements are the book, individual photos and web documentary. These will be compiled differently to suit each location. The Migrant in Krakow during the Krakow Photomonth, on show from 25.04 - 25.05.2018. In collaboration with radio producer Laura Stek, López made a 30-minute radio documentary for OVT, VPRO’s history programme. Taking López’s research into the bird’s history as a starting point, the documentary is embellished with an experimental fictional account told from the bird’s perspective. The experts who appear in the web documentary also feature in the radio documentary. Listen to the documentary here (in Dutch). The Migrant is supported by The Netherlands Filmfund, Creative Industries Fund NL, Free Press Unlimited, Amsterdam Fonds voor de Kunsten and Mondriaan Fund.